Lovely LaLaLand: He's a keeper. Look at what Mike got me for my birthday! We wanted a two person table for the kitchen nook. Mom gave us a small table and chairs but it was too wide--I would sit down on one side and Mike would push the table over toward me so he could get in. Like I said, too wide. 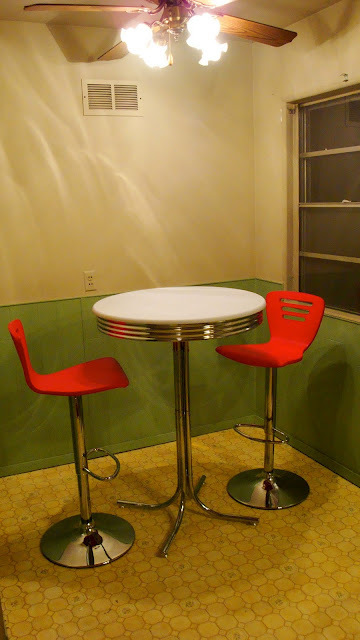 So, we did some shopping online and found this retro-looking high-top table and then the chairs that coordinate. We had very specific desires for the table, and were thrilled when we discovered something that fit the bill. Here is our list of criteria (in random order). 2. High top--we are tall, so a tall table is perfect for us. 5. Styled a little modern and a little vintage--because that's us! For chairs, Mike had more specifics in mind than me, so we came up with a list of those as well. 5. Preferably a wooden seat--ours are! Can you believe we found things that matched all those criteria and were still in our fresh-out-of-college price range? I couldn't. Why red chairs? Because we loved everything about these chairs and they only had them in lime green or red. We figure we can always paint the seats a different color if we need to, but for now, I am really diggin the red. We don't want a red kitchen though--it will be a sparse accent. Thank you Mikey for a wonderful birthday gift! That is a great and perfect set for the two of you. Love it. I bought your bday gift last night in the pouring rain in southern CA. Now I have to come visit to bring you the little gift. Happy Bday Kirsti!